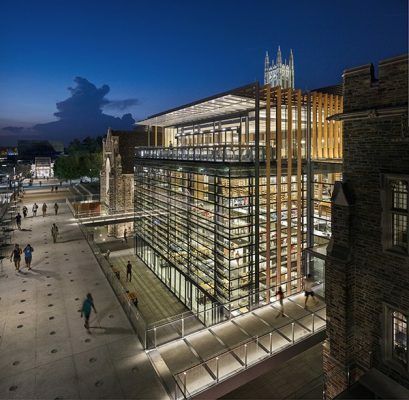 Grimshaw is pleased to announce the completed renovation and expansion of Duke University’s West Campus Union in Durham, North Carolina. 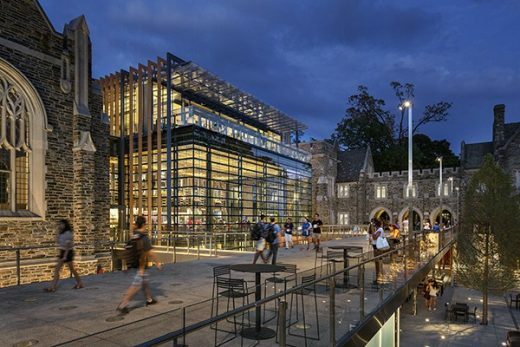 Situated on Abele Quad, the new student union re-establishes itself as the centre-piece for student life and the communal heart of Duke’s historic campus. 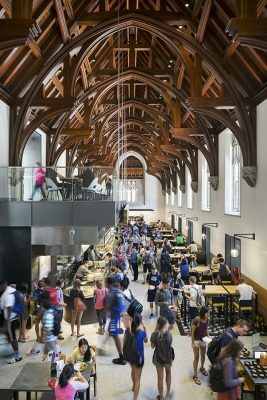 Fostering social interaction, inspiring healthy lifestyles and delivering state-of-the-art culinary excellence, the building brings the Duke community together in an exciting environment that unites the university’s storied history with an active, communal and contemporary experience. As part of the reconstruction, the nearly hundred-year-old structure has seen its legacy spaces restored to their original architectural significance while the central core of the building has been replaced and reimagined. The original structure featured an exterior façade constructed out of locally quarried Duke Stone, while the ornate window tracery, gargoyles, and other decorative elements were carefully crafted from Indiana limestone. These historic elements now frame a transparent atrium that provides a focal point for the building and surrounding academic precinct. Dynamic and overlapping volumes weave together a myriad of activities that enhance the student experience while linking the historic legacy of the West Campus Union to its newfound energy. Steel and glass balconies perched in the gothic wood trusses allow fresh vantage points, and a series of glass bridges enable shortcuts that link previously isolated spaces. 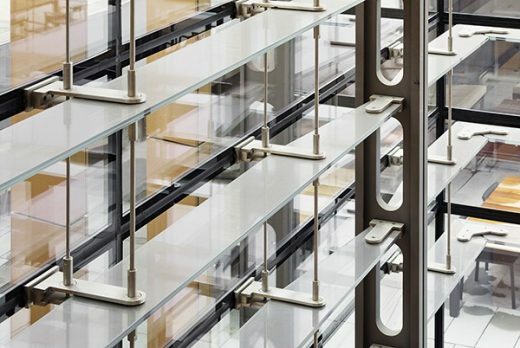 Transparency, connectivity and craftsmanship are central characteristics of the building’s design which invites students in from all directions and activates sightlines across the university precinct. The social hub offers a variety of comfortable and dynamic spaces that encourage students, faculty and alumni to congregate and interact. These student life spaces include environments for both formal and informal study, meetings and presentations, as well as larger spaces for rehearsals and performances. The West Campus Union has become the nerve centre for co-curricular activities at Duke, hosting the University’s diverse collection of clubs and organisations. Conference rooms, small group meeting areas and multi-purpose spaces are spread throughout the building to provide versatile spaces for student connection outside of their residences and classrooms. The new building showcases culinary food exploration and education, housing 12 dining venues showcasing international and local cuisines, in collaboration with local vendors and food concepts. 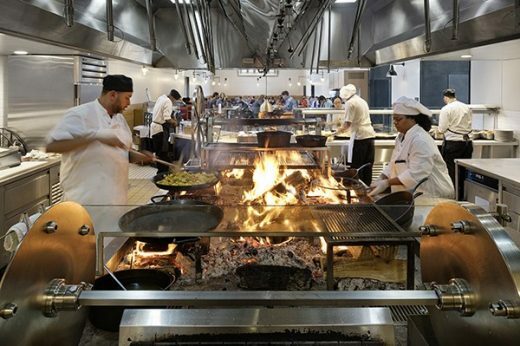 Influenced by the progressive millennial student body, the transformation of the West Campus Union includes greater cultural diversity and novelty with exposed kitchens celebrating food and its preparation. 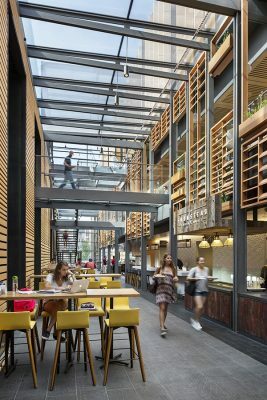 This new core, offset from the surrounding historic dining halls, provides an unencumbered “market” experience. The building’s transformation has also been mirrored by a renovation of the landscape surrounding it, and the Abele Quad is now highly ordered and mature. These areas have been coordinated within the larger landscape master plan and are seamlessly integrated to other recent upgrades on the quad, including Perkins Library. The open expanse has become heavily used as a recreational space for organised student activities and events, as well as impromptu gatherings. The ground-level dining extends out into a newly designed exterior space, the Crown Commons, that includes outdoor dining areas, a beer garden, more contemplative seating areas, and is layered with a new bridge/pavilion, designed by James Carpenter floating above. 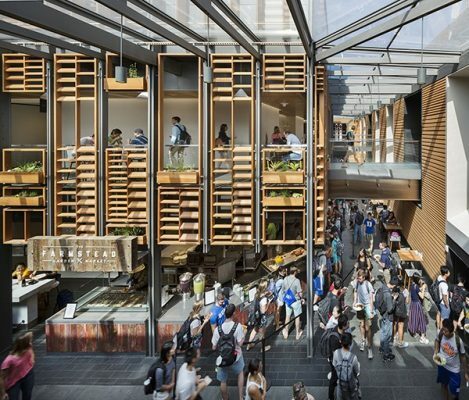 The introduction of these new spaces and connections within the precinct has provided Duke students and faculty with a revitalised communal home that enhances the values already present at the university. 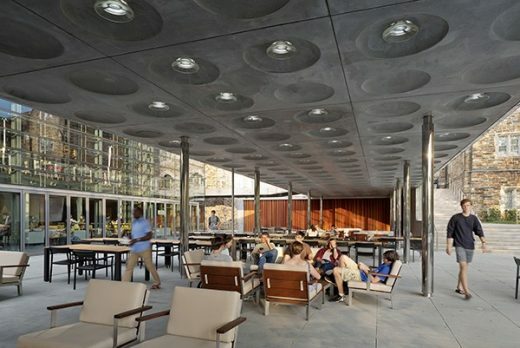 The renovation and expansion of West Campus Union marks a significant architectural intervention that aspires to connect, preserve, and sustain student life.